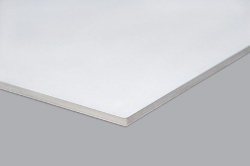 Smart-X is a distinctive and unique lightweight foam board for sophisticated applications in the field of visual communication. Smart-X features an all-plastic sheet material with surfaces of UV and weather resistant solid polystyrene (HIPS) and a core of expanded polystyrene that is completely moisture-resistant. Ideal for both indoor and outdoor use, Smart-X is the worlds only lightweight foam board for external applications without any significant change in colour for a period of up to 2 years. A unique lightweight weather-resistant foam board that can be used indoors and outdoors.